Taharqa was a pharaoh of the Ancient Egyptian 25th dynasty (690–664 BCE) and king of the Kingdom of Kush, which was located in Northern Sudan. In biblical depictions, Taharqa is the saviour of the Hebrew people, as they are being besieged by Sennacherib (Isaiah 37:8-9, & 2 Kings 19:8-9). 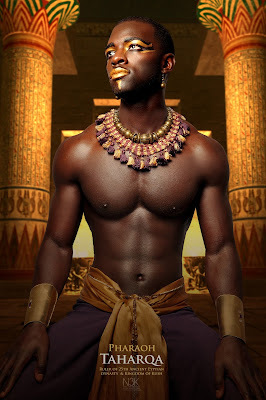 Atlanta, Georgia photographer James C. Lewis' "Icons Of The Bible" photo series depicts some of the most famous characters from the Old and New Testament exclusively as people of color, including Simon Peter, Elijah, King Solomon and Pharaoh Taharqa.